Elizabeth Gilbert picked Sarah Tisdale’s pork product blossoms as the winner of Studio 360’s Redesign Valentine’s Day challenge. Here’s Tisdale’s recipe for bringing home the bacon to your loved one. You’ve seen how a husband and wife team at UnderConsideration re-envisioned the holiday of love. Now see the other winner of Studio 360’s Redesign Valentine’s Day challenge, as picked by this week’s guest, author and modern love expert Elizabeth Gilbert. And, yes…it’s bacon. presented the neighbor with a dozen juicy pork blossoms. and within your intended recipient, for greatest maximum impact. Pick out your bacon. I look for the cuts that have the most meat and less fat. Prepare your muffin tins. Use the hammer and nail to puncture a hole or two in the bottom of each cup. Then set the pans on top of the broiler pan. This allows the fat to drain out while the rosettes are baking. Preheat your oven to about 350-375 degrees. Open up your package of bacon and take a moment to bask in its raw beautiful pink glory. Take one strip and roll it up like a scroll and insert it into the mini muffin tin. You can pull the center of the bacon roll out slightly here if you want to make it a little more stylin’ but no worries, it will look great as is. Repeat until muffin tin is full. Put the whole thing in the oven and bake it until it’s done. Watch it to make sure it doesn’t burn. When it looks dark pink take it out and let it cool a bit. Be careful: the grease will burn you if you spill it. Take the roses out of the tins and set them on the broiler pan. if they aren’t cooked enough put them back in minus the muffin tin for a few minutes. You dont want to overcook them, or you wont be able to skewer the stems. Use the fatter skewers as the stems and poke one into each rose. next, use the little skewers to poke the roses together in a bouquet style. Wrap the whole thing in waxed or parchment paper and then foil (to give it structure and hold it together) and tie it off with a ribbon. 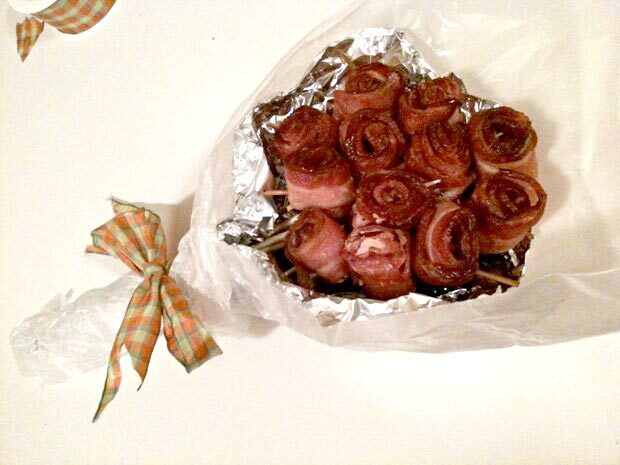 Take a photo of your bacon bouquet. Hand deliver with a card and smile expressing your unconditional love for the boy (or girl) and bacon. 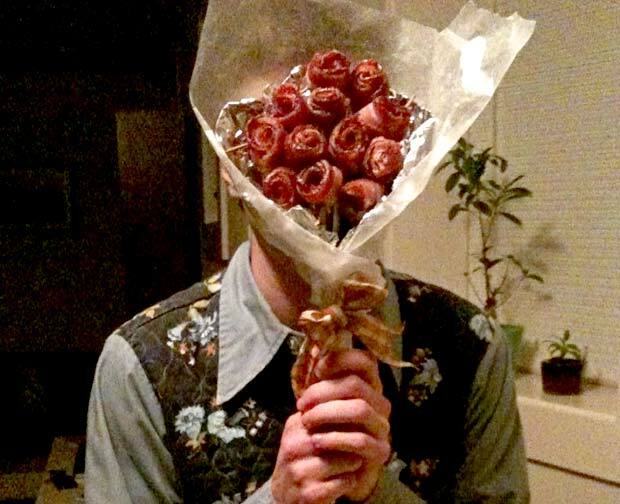 Prepare yourself for an instant marriage proposal on the spot and/or to be ignored for 10-30 minutes as the recipient freaks out over how awesome the bouquet is and starts eating. You can check out hundreds more awesome Valentine’s redesigns and hear more about Gilbert’s top picks. Thanks so much to Kurt Andersen and Michele Siegel, and everyone at Studio 360 for asking me to be a part of such a fun experiment. Whether you celebrate it with glistening pig fat or a Love Puppy, have a wonderful Valentine’s Day.